The solar cell (or photovoltiac cell if you prefer) has been around since the 1800s, trying to effectively catch energy from our perpetually exploding fire ball in the sky, the sun. Harvesting power from the near-limitless amount of energy the sun rains down on us might sound like a match made in heaven for battery electric vehicles. But what cars have made us of these cells thus far, and what does the future outlook of harvesting photons for propulsion hold? For the time being lets start with what is a solar cell? That in itself is a heavy subject, but the most basic explanation can be found in the short video below. So essentially, sunlight goes in, energy comes out, seems like the perfect system. But as stated in the video above, there are several caveats. If you are in an area where there is limited sunlight, then solar cells will do you no good. To illustrate the point, here is a map of the average irradiance within the United States from 1996-2016. 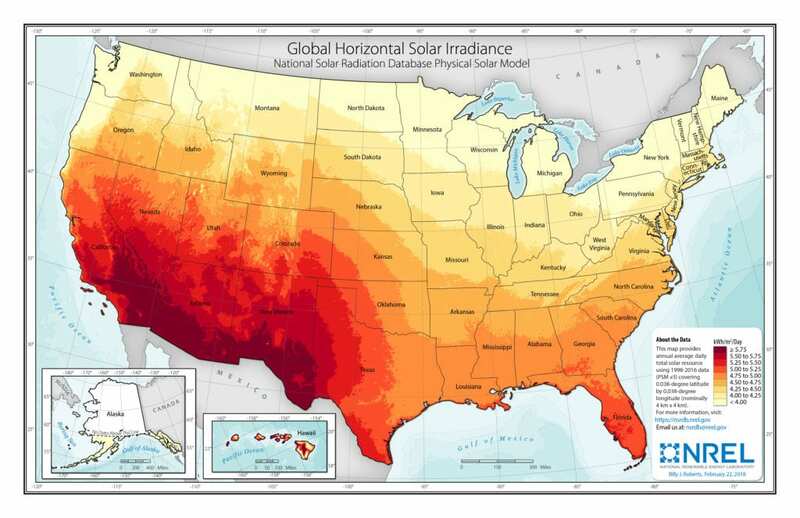 The Department of Energy has an interactive map showing the solar energy potential based on your location. A region like Phoenix, Arizona can capture around 0.6 kilowatts of energy per square foot of solar cells per day. While Seattle, Washington will roughly capture 0.35 kW/ft^2/day, a decrease of almost half. Secondly is the matter of efficiency, currently a solar cell will not harvest all the potential energy that the sun is providing. Almost every transfer of energy results in some sort of loss of energy due to wiring resistances, inverters, etc. Even the simple process of plugging a Tesla into a Supercharger is not a 100% efficient process, instead it is somewhere around the 90% mark. Meaning that, in order for your Model S/X to receive 90 kWh of power, the Supercharger delivers 100 kWh. So it is not an isolated incident of solar cells not being efficient, it’s just that there is no such thing as 100% efficiency at his point. 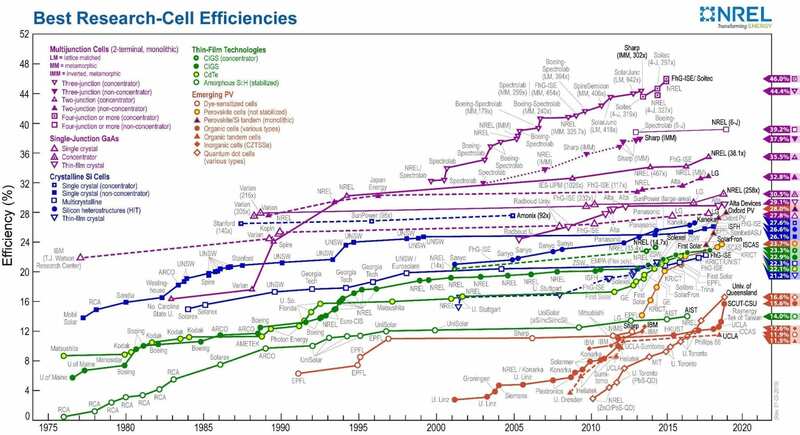 In the mess of a chart below you can see what efficiencies that different researchers and types of solar cells have achieved. While the highest efficiency achieved has been around 46%, but these cells are still prohibitively expensive for mass-production. As such, most commercial solar cells hover around the 20% efficiency range, so there is still a long way to go. 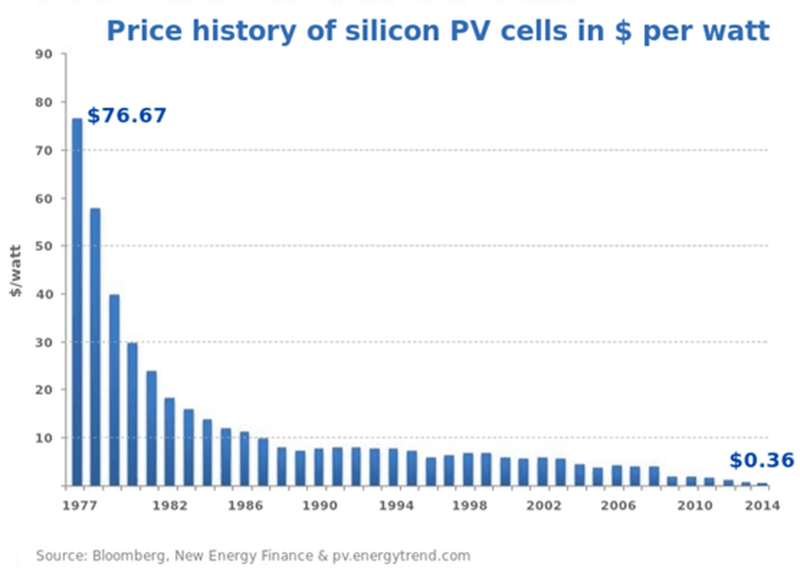 However on the bright side, the cost of these cells per watt have aggressively dropped in the price over the past several decades. Knowing what we know no, lets take a look at some cars consumer cars that have tried to make use of the suns energy. So Where’s the Solar Power? The previous generation Nissan Leaf, sported an optional little solar panel that would be used to trickle charge the cars 12V battery. Obviously this solar panel was too small to contribute to the charging range of the Leaf. But, if you were to leave you car for a long time without starting it up, you would be confident that the solar panel would allow you to come back to a car that had fully functioning interior lights, radio, etc. This list won’t be exclusive to electric cars with solar panels, as there were numerous gas cars that used solar panels for small functions. The reason this entry into the list is so general, as there is simply not much information about these solar sunroofs. The basic principle was within the sunroof, were solar cells that were used to power a ventilation system that would keep the car cool while you were gone. 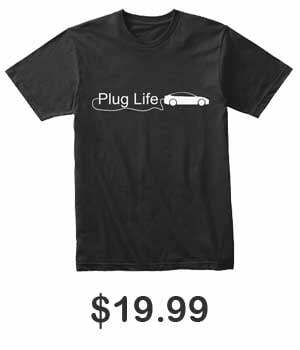 Various automakers had incorporated the system into their vehicles, starting with the (to best of my knowledge) the 1992 Mazda 929, various BMWs such as the E46 M3 shown about, and the Audi A8. While the feature isn’t groundbreaking, it is a nice little addition to vehicle and provided a foothold for displaying the benefits of a car using solar cells. The previous Toyota Prius (non-plug) had a feature similar to the solar sunroof found above(albeit with a much bigger panel that spanned almost the whole roof). The solar cells on the roof would not contribute to the hybrid’s battery, but instead towards powering the ventilation system. However for the newest Prius Plug-in (or Prius Prime as it is known in the US), the solar roof actually contributes to the range of the vehicle as well as help power the auxiliary systems. The solar panel is said to provide around 3 miles of range per day to help the Prime’s 25 mile EPA rated all-electric range. So it’s not a huge amount of range, but hey, free energy is free energy, as long as we don’t think of the cost of the panel. Regardless it’s still nice to see some driving range coming from the use of solar panel. Sadly the solar roof option is not available in the United States as of yet. Similarly to the Prius Prime up top, the Karma Revero plug-in uses a solar roof to help power it’s 21 kWh battery that gets an all electric range of 50 miles. Karma states that the solar panel is good for 500-1000 miles of range in a given year, or 1.37-2.74 miles per day. Once again, it’s not a huge amount of range, but it is something and helps to further cement the usefulness of solar panels in cars, no matter how small. We’ve written about the Sono Sion previously. 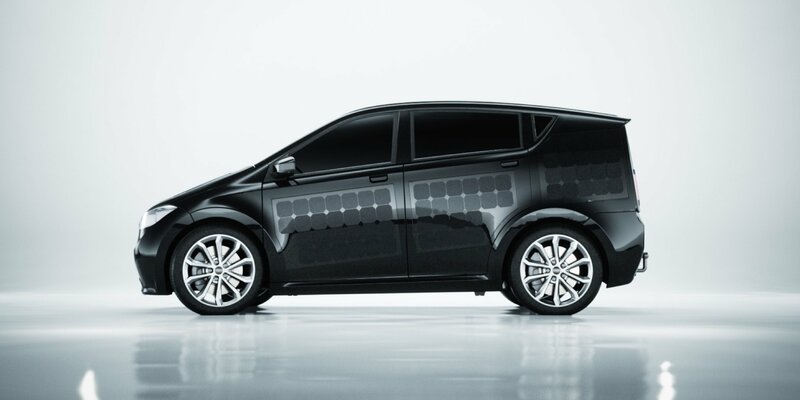 While the cars we’ve mentioned previously listed have treated solar panels as a means to power accessory features, Sono aims to make the solar panels a main focus of the Sion. One easy way to see this commitment is the number of solar panels used, while previous cars stuck to keeping the cells on the roof, Sono has placed solar cells everywhere, the roof, the doors, the hood, all in the hopes to gather as much energy as possible. 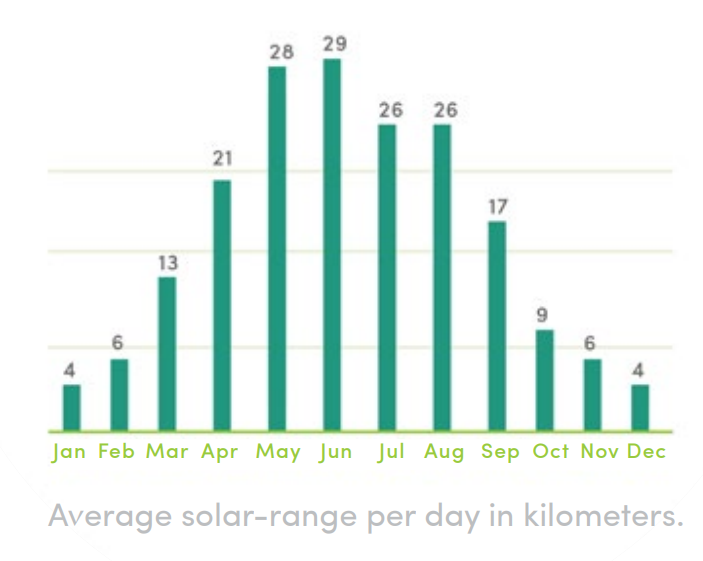 An example of how many miles can be harvested from the sun during various months in Munich (which is roughly in-line with Quebec, Canada) are presented below. So as shown, the Sion can gets as much as 29 km (18 miles) in the summer months and as low as 4 km (2.5 miles) in the winter months of the northerly placed Munich. Additionally Sono claims that their solar panels operate at 24% efficiency which is a little bit better than average in terms of commercial solar panels. The Sion carries a 35 kWh battery that gives a range of 255 km (158 miles), meaning that during the summer months the battery can be fully recharged within 10 days of good weather. But while I applaud the somewhat worth-while use of solar panels, there is still the issue that the design leaves much to be desired. For those of you who only care for the fact that it can recharge itself with the sun, the looks of the car will probably be no problem. But for the majority of car buyers, the numerous solar panels incorporated into every surface of the car may be a turn off. 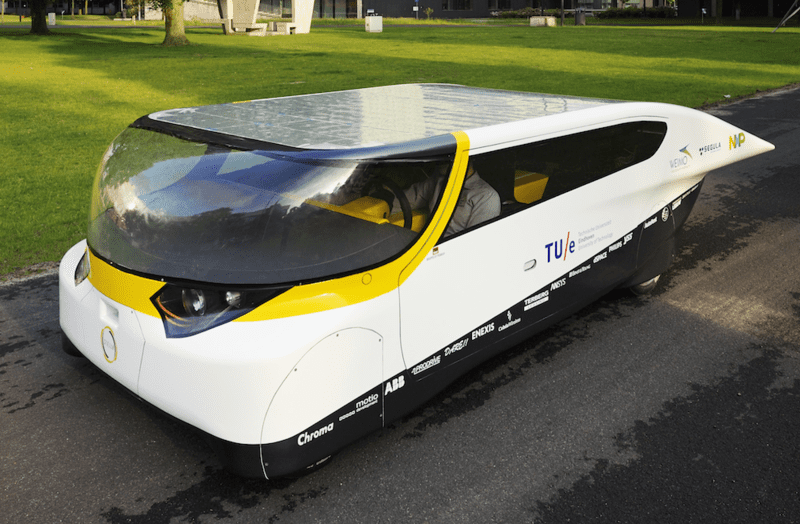 Still the Sion takes solar panel use into an interesting direction, and with even incremental increases to the efficiency of the panels, there will be a significant gain in range due to the high surface area of the car. As time moves forward, the use of solar cells in electric cars will probably become more prominent. We may never get to a point where the solar cells will be the sole thing providing energy to the car, but we will surely see the daily energy intakes that supersede the 2-18 miles a day worth’s of energy we are currently seeing. Hyundai and Kia have stated that they are working on a solar roof that will be able to charge 30-60% of a battery’s capacity within the day (hopefully they aren’t using a 15 kWh plug-in hybrid battery as the measuring point for that statistic.). Recently we reported who teased their first production car, which appears to have the solar panels going all the way down over the rear window and onto the trunk. Lightyear hopes to have the car deliver 5,000-6,000 miles worth of energy from the sun annually. 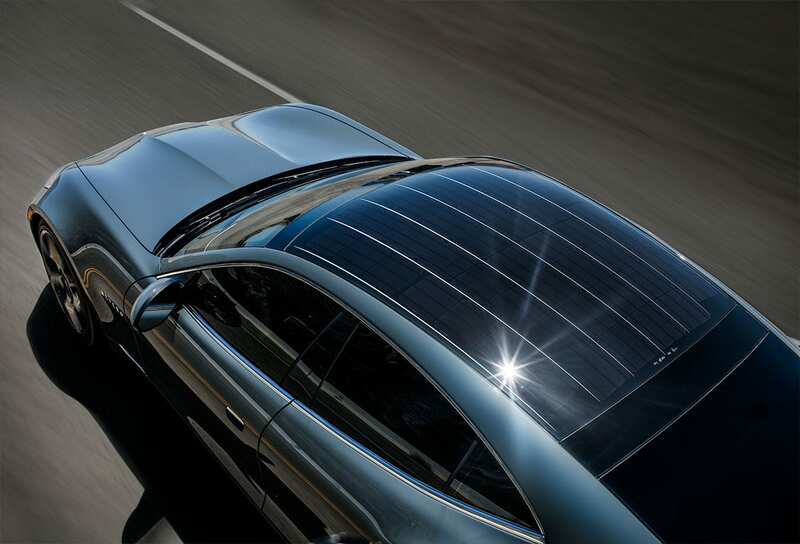 These are just some of the developments regarding the use of solar panels in cars. One look at the participants of the World Solar Challenge or American Solar Challenge, and you can see the potential of using sunlight as a means of vehicle energy.